Ted slot has been a very eye opening experience, having forgotten most of the original film. It's based on 2012 Ted movie directed by Seth MacFarlane (who also does Ted's voice) and starring Giovanni Ribisi and Mark Wahlberg, centring around a boy's Teddy who comes to life and enters an adult world with all the hang-ups and problems of a typical human being. As I didn't know before playing this game, is that the slot very much lives up to the movie! But will you be laughing along with Blueprint Gaming's Ted slot as well? 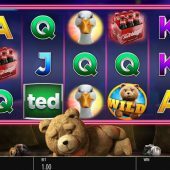 Ted slot is actually a near-clone of Blueprint's King Kong Cash and Wild Antics games with their 6 in-play features along with a barrel roll to select which of 5 bonuses you get when triggering them via the scatters. In this case the snoozing animal character is not the Beetle or Gorilla but obviously our hero Ted. He lies under the reels of this 20-line game of 5 reels and 3 rows on a settee asleep, surrounded by beer cans. This may give you an idea of the character he is - very brusque, flatulent and foul-mouthed with it! The game has single or double symbols except for the titled one 'Ted' which is stacked 3 rows high on all reels. Aside from the card icons you have the stacked Ted or Wild which pay 25x stake for 5-of-a-kind followed by his pin-up girl and the goose for 15x bet down to 2x bet for the lowest of those card icons. Lazer Gun infectious Wilds - he zaps a few positions and they spread from there to give single good win hopefully when the reels stop. You can get from 1 to all of them. Psychedelic Super Spin - Ted reaches for his hookah pipe and exhales a cloud of drugs from behind which many special symbols will appear and all transform to the same one. Beer Shuffle - Once the reels have landed and presented a combination of winning symbols, Ted jumps up to spray froth over them which makes the symbols shuffle in to new winning combinations. It continues until the bubbles all pop. Psychedelic Colossal Spin - Whilst the reels continue to spin Ted will pick up a hookah pipe and immerse the reels in smoke. Once the smoke disperses three of the reels will have formed into colossal 3x3 block symbols guaranteeing a win. TV Remote Symbol Streak - Once the reels have landed with a winning combination Ted jumps up and starts pressing the buttons on a TV remote. This will add more symbols to any winning combination each time, until he presses and no more are added. Psychedelic Bonus Boost - Whilst the reels continue to spin Ted picks up his bong and from behind the cloud the bonus scatters will be made super-stacked in a quantity displayed on the left, say 16 rows high, and this increases feature trigger chance. Wheel of Fartune Bonus - Pick a Ted to reveal an Arrow, Multiplier Boost or Spin. Arrow adds an extra arrow to the Fartune wheel, Multiplier Boost increases the multiplier value of one or more positions on the Fartune Wheel. Land on an arrow to move in a level and if you reach the centre you trigger the Big Money Bonus. The feature ends when you land on a feature or a stake multiplier. -Girls upgrades one or more multiplier values on the board. -Pizza House awards a trail run, so collect multipliers and Big Money counters. -Ming's Takeaway awards a Mystery Cash Bonus Prize. Super Mart Free Spins Bonus - you get 5 free spins. Ted runs along the conveyor belt next to the reels and on the shelves behind the reels will be Ted Wild symbols. Each spin changes the pattern of and the Ted Wild symbols. At the end you get a spin with all the collected Wild added. Flash Free Spins - you get a 5x4 reel format for your Free Spins. 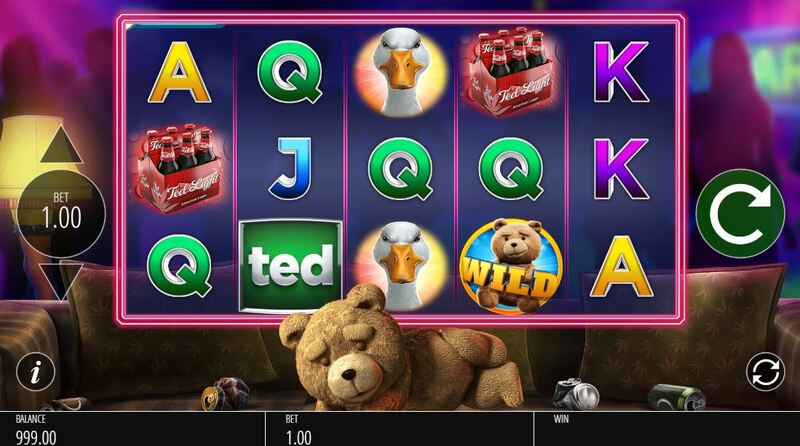 Over the reels is a grid of enhancements like cash prizes, extra spins and wilds. If a Flash icon lands you will awarded a shot in the bonus grid. Each shot means the last position becomes an arrow increasing the chance of advancing further up the grid. The feature ends when no free spins remain or if the player climbs to the top of the bonus grid which awards the Big Money Bonus. Big Money Bonus - Get this far and you see Ted in the centre of a carousel of multipliers along with Sale signs down each side of the screen. The spin stops and you get a x stake award. Pick a Sale anywhere to either respin or end the feature and pay you (hopefully the BIG) cash amount you've collected!